Newly-elected Communist MP Elsa Faucillon on France's divided Left and the way forward in the fight against Macron. 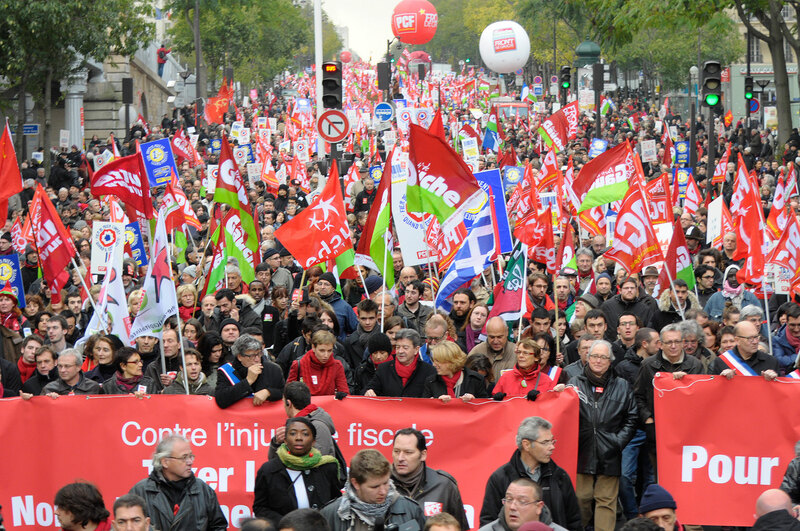 A 2016 rally against Hollande’s labor law. Today’s second round of the French legislative elections delivered a decisive majority for Emmanuel Macron, the country’s newly-elected president, and his party En Marche! While the results were disappointing for the French radical left, especially after the advances made by the Mélenchon campaign, the result will likely treble its representation in parliament – from 10 to 30 MPs. One of those elected is Elsa Faucillon of the French Communist Party, who topped the poll in Gennevilliers, a suburb in Paris’ northwest. In the final days of the campaign she spoke to Jacobin contributor Maxime Benatouil about the challenges these elections have posed and the prospects for Left realignment in their wake. In the presidential election 7 million people voted for Jean-Luc Mélenchon but only 2.5 million voted for France Insoumise in the first round of the legislative elections. What do you think the reasons are for that difference? To those 2.5 million we have to add those who voted for the Parti communiste français (PCF), the Front de Gauche [Left Front, including the PCF, Left Party and Ensemble], as well as other figures who identify with or are recognised as carrying forward Jean-Luc Mélenchon’s program for the presidential election. That still is not 7 million but it takes us beyond 3 million, maybe 3.5 million. For example, in my constituency, those who voted for my own candidacy can be added to these 2.5 million. I say that because there are a lot of us carrying forward the program that Jean-Luc Mélenchon presented at the presidential election – not only members and sympathizers of France Insoumise, but also those like myself who are not members but promoted L’Avenir en Commun. The strength of the Mélenchon campaign was that over time he made people realise that it was possible to win. That gave him a lot of strength, and brought a lot of hope. I started campaigning for Mélenchon’s presidential bid in November, and in a working-class constituency like my own it was incredible to see how people who don’t vote or vote without much enthusiasm were suddenly now able to quote verbatim from the program and from Mélenchon’s speeches. They did so not only with the hope of victory, but also with the hope of profound change. How would you explain the fact that these people did not mobilize again for the parliamentary elections? During the presidential elections, I heard a lot of people say ‘he speaks for us’, ‘he speaks with our heart and soul’. That was a feeling of pride in belonging to a working-class community. Not a feeling of closed-minded retreat, but of solidarity and openness to others. And it was very strong. But it was developed with a sense that victory was possible. I am not a political scientist and can only see things from my perspective as an activist and a candidate. But the presidential election is the central space of French politics, especially in the Fifth Republic. That is even moreso the case since Sarkozy created a more powerful role for the president. Under Hollande we had a National Assembly that voted for whatever the president asked. The National Assembly has taken a backward step, in terms of its job of deliberation and debate. So if people ask themselves whether electing an MP is going to change their lives, I don’t think many believe that it will. The two elections that people in France see as important to their lives are the presidential and municipal contests. Also, I would say that while Jean-Luc Mélenchon has a great power of attraction when he speaks to crowds, and is a national figure representing France Insoumise, at the parliamentary elections that kind of politics is bound to be less energising and less impactful than during the presidential election. With the exception of fifty or so seats, France Insoumise and the PCF could not reach an agreement to campaign together. Could you tell us what the reasons for that were? I have been a member of the PCF since 2005, the campaign against the European Constitutional Treaty. It was that campaign that showed the attractive prospect of working together with others on the Left who want to transform society, and of this Left becoming a force that can win. This is where the Front de Gauche came from, as a political alternative that allows this Left, in all its diversity and pluralism, to work together. Within the PCF I have been a supporter of the Front de Gauche model of collective working and debate. But I think that despite all the efforts made the Front has remained too much of a cartel of parties, operating through the leaders of the organisations that comprise it. And of course there have been a lot of differences in terms of what strategic course it should follow. Given that, and the failure to open it to citizens more broadly, it quickly fell into a kind of confrontation between opposing ‘lines’, and not so much a discussion on a new left-wing project. So the Front de Gauche was less and less able to be an attractive force at the electoral level. The presidential election arrived at a moment when it was not in very good shape. The PCF advocated participation in the primaries of the Left [ultimately a contest among Parti socialiste (PS) candidates and members of small allied parties]. But having been the Front de Gauche candidate in 2012, Jean-Luc Mélenchon went out on a limb to announce his own candidacy. So at its conference the PCF discussed what to do, and the debates of the last two years had their effect. It took some time to get unity going, but fortunately by November 2016 the Communists were in a position to be able to support Mélenchon’s candidacy. Inevitably, the Front de Gauche’s dynamic was not the same as it had been in 2012. And in this context it is not hard to see why the negotiations for the parliamentary elections did not turn out well. I really regret that. I do not think joint candidacies would somehow have allowed us a parliamentary majority, but we certainly could have been a strong Left alternative in the National Assembly. There would have been no doubt who the alternative to Macron is. Nonetheless that remains possible, and such a pact could be achieved in future. Emmanuel Macron secured a huge majority in the legislative elections, one of the largest in the history of the Fifth Republic. Does that indicate overwhelming support for his program? And what is this program? Macron’s program is a strongly neoliberal and austerian one, committed to destroying the Labour Code. It is the programme of the MEDEF [employers’ association]. We have seen the outlines of the Loi Travail [Labor Law] part two. Clearly there were things that El Khomri, who was behind the first law, wanted to do but knew she could not pass. And even what remained was unprecedented. More than just pointing to its neoliberal character, I would also say that his program will be very authoritarian, in the manner of Manuel Valls [the former Prime Minister]. Even if Macron is keen to present himself as gentle and kindly, the presidential decrees he speaks of issuing are deeply anti-democratic. He is also going to extend the state of emergency. That will aggravate an authoritarian climate. The Macron project, such as he and the whole media, business, political and indeed cultural system presents it, forms part of a climate in French society and politics where it is said that there should be no more political conflict. Macron has captured that moment very well, with his talk of being ‘neither Left nor Right’, and bringing in people from centre-left and right as well as civil society. Even if that seems like a trick, it does correspond to something in French society where people say they have had enough of being ‘for and against’, enough of conflict, and want everything to calm down. But that also means calming down class conflict, pretending that there are no interests of the rich and interests of the poor. In reality, Hollande had already been practicing this without being a figure who broke from the traditional parties. As for the support for his program, he got 24 percent in the presidential first round. That was not such an impressive score. There has also been a low turnout this time. But we must understand that there is a widespread sentiment, which we see in his high percentage in the parliamentary elections, that he should be given a chance. On March 19, there was a March for Justice and Dignity in Paris, an initiative launched by the families of victims of police violence, and supported by many associations in the quartiers populaires [working-class neighborhoods with large ethnic minority populations]. Their demands were: no more violence, no more state racism, and peace in their neighborhoods. Do you think the traditional left has been sufficiently supportive of these demands? And could we link them to a wider disillusionment with the political class? As a member of a party of the traditional Left, I must say that no, we have not sufficiently taken these demands on board. There is still work to do. And in terms of the link you suggest to a wider disillusionment, that is certainly there. There is work to do for the PCF and for France Insoumise — even if is not a party but a movement — for the Greens, and for smaller parties. But beyond recognizing that fact, there is a need for action. And speaking of my party specifically, there are debates and disagreements on what precisely that means. For example, with reference to the 19 March demonstration, there were debates on whether to participate – and yes, we agreed that should – but also on what appeal to make, and with whom we should participate. There were groups in the associative milieu who we did and did not want to work with. So there were divisions even among those who did want to work on these questions. Perhaps as a woman I feel about this a bit like how I feel about the way the question of feminism was received within the parties of the Left. I know this subject a little better, also having read about and studied it. For example, I know that at a certain time feminist issues were very little accepted in the PCF. We needed to be able to discuss sexism among ourselves, as women, and this was not facilitated. It was very badly received among men in the Communist milieu, and also some women, who thought this was not our role. Antiracism and feminism are not the same question, but we can see something of the same in the debates today. We need to reflect on this. We cannot lie to ourselves – a lot of the people organizing on violence and police racism are not members of our party. But it is a major social issue impacting the working-class. So we have to work on that, to bring other people in, and to have confidence in associations, public figures and individuals who are fighting this fight. Police violence also poses the PCF the question of the police in general: what should it be? Talking about police violence does not in itself address the question of what the police force should be. Yes, we can say there is racism among the police, but that is not to put in question the police as a whole. Is its role to keep the peace and protect French citizens? There is a reticence to discuss this, even at a sociological level, with the high Front National vote among the police. But there is a basis for posing such questions. In the presidential election France Insoumise tried to create something new on the French political scene, with a left-populist strategy where the main divide was the people versus the oligarchy. But it was also a movement that moved away from the broad Left approach that had been attempted previously. This approach suffered from long-standing differences, especially concerning the possibility of reforming the EU, and environmental questions such as nuclear power. After the electoral cycle is over, will it be possible to overcome these political and strategic differences in the work of recomposing the Left? I think that the novelty, the sense of rupture, the clarity brought by France Insoumise is a very important element. We saw that in the presidential election vote. It responds to the need for any Left that wants to transform society to lay down some foundations and to make itself a possible winner — not only in an electoral sense, but also in terms of ideas. But while I do think that it made a contribution in that regard, I believe that France Insoumise’s lack of respect for the diversity of the transformative Left could lead it to difficulty. Also, populism is not my political culture. I think we do need to work using the Left-Right divide, which remains relevant for a large part of the French population. As a candidate for the second round in the parliamentary election, the fact that I can say that I am bringing together the Left is important – it is something that people understand and which rallies their support. The Left-Right divide is still a compass for many. It is also true that for a lot of people this has been totally blurred by the succession of the Left and Right in government, from Sarkozy to Hollande. So the divide between dominated and dominant, or the people and the oligarchy, also allows a new form of identification. This France Insoumise understood very well. Within this project, is there a place for what remains of the Parti socialiste (PS)? In the first round of the presidential election it fell back to just 6 percent of the vote, a historic low, and then it repeated this negative result in the first round of the parliamentary elections. Can it play any role in the Left moving forward? Before I can answer I should say that I think we – the PCF, and the transformative Left – have interrogated our own strategy rather too much in terms of its relationship with the PS. It was hegemonic on the Left, and faced with a PS that organized social democracy entirely in terms of a neoliberal project, we needed to say that is not what the Left is. I think the 2017 presidential election allowed us to say this, which opened up new definitions and markers for the people. That was one of the wagers that Jean-Luc Mélenchon made, and partly succeeded in. It is something to be welcomed, and I share in that need for a rupture with social democracy in order to rebuild. It clarified things, and was a step forward – so I do not want to return to a time when the reconstruction of the Left was posed in terms of what will happen with the PS. They have problems to solve for themselves. But there is a part of French society that remains loyal to the PS, who feel represented by its politics. I do not think that we want a clash with them: they are still part of the Left. I imagine that they are today looking for a compass, and we have to be up to the task of providing them with an environment where they will feel welcome. It is difficult to say what the PS is today. Its figures, its staff, its members are not one single entity. Part of it has gone off toward Macron and En Marche. And it is also important to be clearly aware that the reason it got 6 percent was that it embodied defeat and had no prospect of winning after the Hollande years. There was a very strong sense of disillusionment. I do not know what will become of the PS. But it has often been said that the Communist Party is dead and it has outlived these claims. The necessary work of stopping the Parti socialiste being the leading force on the Left has now been realised. That does not mean we will be able to take all of the Left vote. To give a very concrete example, in my own constituency (Gennevilliers) there was a PS MP. He was elected on the Hollande wave of 2012, whereas beforehand there had been a PCF MP, Roland Muzeau. In the town of Colombe, within the constituency, in 2012 Muzeau scored two thousand votes. If you take my own score in the first round of the parliamentary elections there and add on the vote for France Insoumise, it is exactly two thousand votes. Even while the Parti socialiste has collapsed and even though Jean-Luc Mélenchon did well in the presidential elections, in Colombe at least the transformative Left has done no better than in 2012. The Parti socialiste is no longer the leading force on the Left, but the Left is not yet in good shape. What really interests me is how we can accomplish the challenging task of rebuilding the Left. That means a Left that concerns itself with the March for Dignity and Justice, a Left that makes feminism relevant for our own time, and a Left that can bring the popular classes back onto the political terrain. That means the people we aim to represent coming into the National Assembly, in all their diversity. That is the challenge we face. We have some of the ingredients for that, but not the whole recipe. Elsa Faucillon is French Communist Party candidate for the Gennevilliers constituency in the northwest of Paris. Maxime Benatouil is the director of the Transform Network, the political foundation of the European Left Party.